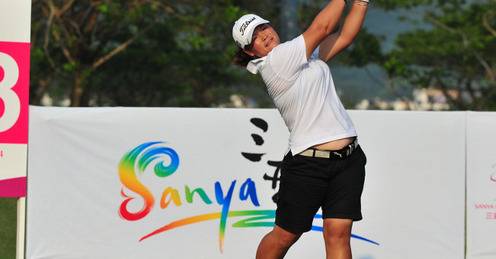 China’s own Pan Yan Hong lead the way at the Sanya Ladies Open in Hainan after a second-round, 3-under 69 enabled her to hold on to her one stroke lead at Yalong Bay Golf Club. The 28-year-old professional finished at eight under par, a stroke ahead of Thailand’s Patcharajutar Kongkraphan, who also carded a steady 69 thanks to four birdies and as against just one bogey. If Pan is able to maintain her form on Sunday, she could be the first Chinese winner on both of the two co-santioning Tours, the Ladies Asian Golf Tour and the Ladies European Tour. Pan credited her performance to working well with her Guangdong-based caddie, Wu Kangchun, who is a touring professional on the China PGA Champions tour. "My caddie is also my coach and a huge source of inspiration. Under him my results have improved tremendously," she said, through an interpreter. The pressure will be on with just 18 holes to play, as 23 players are within six strokes of the lead and ready to pounce. Behind Kongkraphan, England’s Rachel Bell (67), Scotland’s Vikki Laing (69) and Australian Frances Bondad (70) are sharing third place and, at six under, are all in the hunt and hungry to take away a first professional victory. Bell, currently 117th on the LET’s Henderson Money List after 14 starts this season, will enhance her chances of securing her tour card for 2012 if she can maintain her current position, while Laing, ranked 10th on the list last year, also needs a strong finish to avoid a return to Qualifying School in January. Among six players on five under and just three off the pace is 15-year-old Lin Xiyu, who tied for ninth place in the 2010 event as an amateur. She turned professional in September and is looking to earn world ranking points in order to improve her chances of representing China at The 2016 Olympic Games in Rio da Janeiro. The impressive teen, who is a member of the Chinese national team, has a chance to become the youngest ever winner on the Ladies European Tour, aged 15 years, seven months and 27 days. "Last year we were preparing for the Asian Games and we just trained very hard but my level was not that high. This year I improved a lot so I’m very confident because last year I kind of freaked because I shot 66. This year I feel good in every part so I believe that I can play very well," said Lin, who qualified for the U.S. Women’s Open earlier this summer, where there were interruptions. "I had 72, 81, but I played 30 holes in one day, because of the weather. The first round I didn’t hit any balls, the second day I played 30 holes and the third day I played six holes, so I just couldn’t find the feeling," she explained. Meanwhile South Ashleigh Simon, who won the 2007 Catalonia Ladies Masters as an 18-year-old professional, is also on five under and looking to add another title after earning this May’s Portugal Ladies Open. She and Lin share sixth place with Thailand’s Nontaya Srisawang, Australian rookie Stacey Keating, Spain’s Tania Elosegui and Christine Song from the United States. Finland’s Minea Blomqvist and Thailand’s Thidapa Suwannapura ended a shot further behind, while the 2010 champion Lee-Anne Pace of South Africa is three under and still in the hunt.